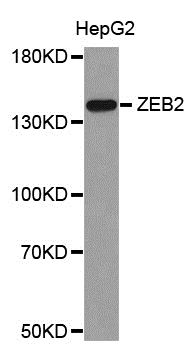 Rabbit anti ZEB2 antibody recognizes Zinc finger E-box-binding homeobox 2 also known as ZEB2 or Smad-interacting protein 1. ZEB2 is a transcription factor that belongs to the delta-EF1/ZFH-1 C2H2-type zinc-finger family of proteins. ZEB2 is involved in fetal development via the TGF-beta signaling pathways. Antiserum to ZEB2 was raised by repeated immunization of rabbits with highly purified antigen. Purified IgG was prepared from whole serum by affinity chromatography.